Fisher was born William August Fisher on July 11, 1903, in the Benwell area of Newcastle upon Tyne, the second son of Heinrich and Lyubov Fisher. Revolutionaries of the Tsarist era, his father was of German origins and his mother was of Russian descent. Fisher's father, a revolutionary activist, taught and agitated with Vladimir Lenin at Saint Petersburg Technological Institute. In 1896 he was arrested for sedition and sentenced to three years internal exile. As Heinrich Fisher had served a sentence for offenses against the Russian state, he was forced to flee to the United Kingdom in 1901, the alternative being deportation to Germany or imprisonment in Russia for avoidance of military service. While living in the United Kingdom, Fisher's father, a keen Bolshevik, took part in gunrunning, shipping arms from the North East coast to the Baltic states. Fisher and his brother, Henry, won scholarships to Whitley Bay High School and Monkseaton High School. Though Fisher was not as hard working as Henry, he showed aptitude for science, mathematics, languages, art and music, inherited in part from his father's abilities. Encouraging their son's love of music, Fisher's parents gave him piano lessons; he also learned to play the guitar. It was during this period that Fisher developed an interest in amateur radio, constructing rudimentary spark transmitters and receivers. Fisher became an apprentice draughtsman at Swan Hunter, Wallsend, and attended evening classes at Rutherford College before being accepted into London University in 1920. Though Fisher qualified for university, the costs prohibited him from attending. In 1921, following the Russian Revolution, the Fisher family left Newcastle upon Tyne to return to Moscow. Fluent in English, Russian, German, Polish and Yiddish, Fisher worked for the Comintern as a translator following his family's return to the Soviet Union. Trained as a radio operator, he served in a Red Army radio battalion in 1925 and 1926. He then worked briefly in the radio research institute before being recruited by the OGPU, a predecessor of the KGB, in May 1927. That year he married Elena Lebedeva, a harp student at Moscow Conservatoire. They had one child together, a daughter named Evelyn who was born on October 8, 1929. During his interview with the OGPU, it was determined he should adopt a Russian-sounding name and William August Fisher became Vilyam Genrikhovich Fisher. Following his recruitment, he worked for the OGPU as a radio operator in Norway, Turkey, the United Kingdom, and France. He returned to the Soviet Union in 1936, as head of a school that trained radio operators destined for duty in illegal residences. One of the students was the British-born Russian spy Kitty Harris, who was later more widely known as "The Spy with Seventeen Names". Despite his foreign birth and the accusation that his brother-in-law was a Trotskyist, Fisher narrowly escaped the Great Purge. He was, however, in 1938, dismissed from the NKVD, which in 1934, replaced the OGPU. During World War II, he again trained radio operators for clandestine work behind German lines. Having been adopted as a protégé by Pavel Sudoplatov, he took part in Operation Scherhorn (Операция Березино, Operatsiya Berenzino) in August 1944. Sudoplatov later described this operation as "the most successful radio deception game of the war". Fisher's role in this operation was rewarded with what his superiors regarded as one of the most prestigious postings in Russian foreign intelligence, the United States. After rejoining the KGB in 1946, Fisher was trained as a spy for entry into the United States. In October 1948, using a Soviet passport, he travelled from Leningradsky Station to Warsaw. In Warsaw, he discarded his Soviet passport and using a U.S. passport travelled via Czechoslovakia and Switzerland to Paris. His new passport bore the name Andrew Kayotis, the first of Fisher's fake identities. The real Andrew Kayotis was Lithuanian born and had become an American citizen after migrating to the United States. Kayotis had applied for and received a visa to visit the Soviet Union. However, the Soviets retained his passport, which Fisher eventually used. Kayotis had been in poor health and died while visiting relatives in Vilnius, Lithuania. Fisher, as Kayotis, then travelled aboard the RMS Scythia from Le Havre, France, to North America, disembarking at Quebec. Still using Kayotis' passport, he went to Montreal and crossed into the United States on November 17. On November 26, Fisher met with Soviet "illegal" Josef Romvoldovich Grigulevich (codenamed "MAKS" or "ARTUR"). Grigulevich gave Fisher a genuine birth certificate, a forged draft card and a forged tax certificate, all under the name of Emil Robert Goldfus, along with one thousand dollars. After handing back Kayotis's passport and documents, Fisher assumed the name Goldfus. His codename was "MARK". The real Goldfus had died at only 14 months, having been born on August 2, 1902, in New York. Goldfus's birth certificate was obtained by the NKVD at the end of the Spanish Civil War, when the Centre would collect identity documents from International Brigades members for use in espionage operations. In July 1949, Fisher met with a "legal" KGB resident from the Soviet consulate general, who provided him with money. Shortly afterwards Fisher was ordered to reactivate the "Volunteer" network to smuggle atomic secrets to Russia. Members of the network had stopped cooperating after postwar security was tightened at Los Alamos. Lona Cohen (codenamed "LESLE") and her husband Morris Cohen (codenamed "LUIS" and "VOLUNTEER") had run the Volunteer network and were seasoned couriers. Theodore "Ted" Hall (codenamed "MLAD"), a physicist, was the most important agent in the network in 1945, passing atomic secrets from Los Alamos. The Volunteer network grew to include "Aden" and "Serb", nuclear physicists contacted by Hall, and "Silver". Fisher spent most of his first year organizing his network. While it is not known for certain where Fisher went or what he did, it is believed he travelled to Santa Fe, New Mexico, the collection point for stolen diagrams from the Manhattan Project. Kitty Harris, a former pupil of Fisher's, had spent a year in Santa Fe during the war, where she passed secrets from physicists to couriers. During this period, Fisher received the Order of the Red Banner, an important Soviet medal normally reserved for military personnel. In 1950, Fisher's illegal residency was endangered by the arrest of Julius and Ethel Rosenberg, for whom Lona Cohen had been a courier. The Cohens were quickly spirited to Mexico before moving on to Moscow. They were to resurface in the United Kingdom using the identities of Peter and Helen Kroger. Fisher was relieved the Rosenbergs did not disclose any information about him to the Federal Bureau of Investigation (FBI), but the arrests heralded a bleak outlook for his new spy network. However, on October 21, 1952, as instructed by Moscow, Reino Häyhänen left a thumbtack on a signpost in New York's Central Park. The thumbtack signaled to Fisher that Häyhänen, his new assistant, had arrived. Codenamed "VIK", Häyhänen arrived in New York on the RMS Queen Mary, under the alias Eugene Nikolai Maki. The real Maki had been born in the United States to a Finnish-American father and a New York mother in 1919. In 1927, the family migrated to Estonia. In 1948, the KGB called Häyhänen to Moscow where they issued him a new assignment. In 1949, Häyhänen freely obtained Maki's birth certificate. He was then to spend three years in Finland taking over Maki's identity. After arriving in New York, Häyhänen spent the next two years establishing his identity. During that time he received money from his superiors left in dead-letter boxes in the Bronx and Manhattan. It is known he occasionally drew attention to himself by indulging in heavy drinking sessions and heated arguments with his Finnish wife Hannah. For six months Häyhänen checked the thumbtack and no one had made contact. He also checked a dead-drop location he had memorized. There he found a hollowed-out nickel. However, prior to opening the coin Häyhänen had misplaced it, either buying a newspaper with it or using it as a subway token. For the next seven months the hollow nickel travelled around the New York City economy, unopened. The trail of the hollow nickel ended when a thirteen-year-old newsboy was collecting for his weekly deliveries. The newsboy accidentally dropped the nickel and it broke in half, revealing a microphotograph containing a series of numbers. The newsboy handed the nickel to a New York detective, who in turn forwarded it to the FBI. From 1953 to 1957, though every effort was made to decipher the microphotograph, the FBI was unable to solve the mystery. Late in 1953, Fisher moved to Brooklyn and rented a room in a boarding house on Hicks Street. He also rented a fifth-floor studio at the Ovington Studios Building on Fulton Street. Since he was posing as an artist and photographer, nobody questioned his irregular working hours and frequent disappearances. Over time his artistic technique improved and he became a competent painter, though he disliked abstract painting, preferring more conventional styles. He mingled with New York artists, who were surprised by his admiration for the Russian painter Isaak Levitan, although Fisher was careful not to discuss Stalinist "socialist realism". The only visitors to Fisher's studio were artist friends with whom he felt safe from suspicion. In particular, he became a friend of Burton Silverman. Fisher sometimes related made-up stories of previous lives, as a Boston accountant and a lumberjack in the Pacific Northwest. In 1954, Häyhänen began working as Fisher's assistant. He was to deliver a report from a Soviet agent at the United Nations secretariat, to a dead-letter box for collection. However the report never arrived. Fisher was disturbed by Häyhänen's lack of work ethics and his obsession with alcohol. In the spring of 1955, Fisher and Häyhänen visited Bear Mountain Park, and buried five thousand dollars, (equivalent to $46,764 in 2018), destined for the wife of the Soviet spy Morton Sobell, who in 1951 was sentenced to thirty years in jail. In 1955, Fisher, exhausted by the constant pressure, returned to Moscow for six months of rest and recuperation, leaving Häyhänen in charge. While in Moscow, Fisher informed his superiors of his dissatisfaction with Häyhänen. Upon his return to New York in 1956, he found that his carefully constructed network had been left to disintegrate in his absence. Fisher checked his drop points only to find messages several months old, while Häyhänen's radio transmissions had routinely been sent from the same location using incorrect radio frequencies. The money Häyhänen received from the KGB to support the network was instead spent on alcohol and prostitutes. By early 1957, Fisher had lost patience with Häyhänen and demanded that Moscow recall his deputy. In January 1957, Häyhänen received a message from Moscow promoting him to Lieutenant Colonel and granting him leave in the Soviet Union. Upon hearing he was due to return to Moscow, Häyhänen was fearful that he would be severely disciplined or even executed. Häyhänen fabricated stories to justify his delay, claiming to Fisher that the FBI had taken him off the RMS Queen Mary. Fisher, unsuspecting, advised Häyhänen to leave the U.S. immediately to avoid FBI surveillance and handed him two hundred dollars for travel expenses. Prior to his departure, Häyhänen returned to Bear Mountain Park and retrieved the buried five thousand dollars for his own use. Häyhänen arrived in Paris on May Day, having sailed from the U.S. aboard La Liberté. Making contact with the KGB residency he received another two hundred dollars for his journey to Moscow. Four days later, instead of continuing his journey to the Soviet Union he entered the American embassy in Paris, announcing that he was a KGB officer and asking for asylum. When Häyhänen announced himself at the embassy on 4 May, he appeared drunk. The Central Intelligence Agency (CIA) officials at the Paris embassy did not find Häyhänen's story credible. They were not convinced he might actually be a Russian spy until he produced a hollow Finnish 5-mark coin. Upon opening the coin a square of microfilm was revealed. On May 11, the CIA returned him to the United States and handed him over to the FBI. As a member of a Soviet spy ring operating on American soil, Häyhänen came under the FBI's jurisdiction and they began verifying his story. Upon his arrival in the United States, Häyhänen was interrogated by the FBI and proved very cooperative. He admitted his first Soviet contact in New York had been "MIKHAIL" and upon being shown a series of photographs of Soviet officials identified "MIKHAIL" as Mikhail Svirin. Svirin, however, had returned to Moscow two years previously. The FBI then turned its attention to Svirin's replacement. Häyhänen was able only to provide Fisher's codename, "MARK", and a description. He was, however, able to tell the FBI about Fisher's studio and its location. Häyhänen was also able to solve the mystery of the "hollow nickel," which the FBI had been unable to decipher for four years. The KGB did not discover Häyhänen's defection until August, although it is more than likely they notified Fisher earlier when Häyhänen failed to arrive in Moscow. As a precaution, Fisher was ordered to leave the United States. Escape was complicated because, if "MARK" had been compromised by Häyhänen, Fisher's other identities could have been compromised as well. Fisher could not leave the country as Martin Collins, Emil Goldfus, or even the long-forgotten Andrew Kayotis. The KGB Center, with the help of KGB's Ottawa resident, set about procuring two new passports for Fisher in the names of Robert Callan and Vasili Dzogol, but this process would take time. The Canadian Communist Party succeeded in obtaining a new passport for Fisher in the name of Robert Callan. Fisher, however, was arrested before he could adopt his new identity and leave the United States. In April 1957, Fisher told his artist friends he was going south on a seven-week vacation. Less than three weeks later, acting on Häyhänen's information, surveillance was established near Fisher's photo studio. On May 28, 1957, in a small park opposite Fulton Street, FBI agents spotted a man acting nervously. From time to time the man got up, walked around, and eventually left. FBI agents were convinced he fit the description of "MARK". The surveillance continued on "MARK" and, on the night of June 13, a light was seen to go on in Fisher's studio at 10:00 pm. On June 15, 1957, Häyhänen was shown a photograph of Fisher taken by the FBI with a hidden camera. Häyhänen confirmed that it was "MARK" in the photograph. Once the FBI had a positive identification, they stepped up surveillance, following Fisher from his studio to the Hotel Latham. Fisher was aware of the "tail" but, as he had no passport to leave the country, he devised a plan to be used upon his capture. Fisher decided that he would not turn traitor as Häyhänen had done because he still trusted the KGB and he knew that if he cooperated with the FBI, he would not see his wife and daughter again. At 7:00 am on June 21, 1957, Fisher answered a knock on the door to his room, Room 839. Upon opening the door, he was confronted by FBI agents who addressed him as "colonel" and stated that they had "information concerning [his] involvement in espionage." Fisher knew that the FBI's use of his rank could have only come from Häyhänen. Fisher said nothing to the FBI and, after spending twenty-three minutes staring at Fisher, the FBI agents called in the waiting Immigration and Naturalization Service officers who arrested Fisher and detained him under section 242 of the Immigration and Nationality Act. Fisher was then flown to the Federal Alien Detention Facility in McAllen, Texas, and held there for six weeks. During this period Fisher stated that his "real" name was Rudolf Ivanovich Abel and that he was a Soviet citizen, although he refused to discuss his intelligence activities. The name "Rudolf Ivanovich Abel" was that of a deceased friend and a KGB colonel; Fisher knew as soon as The Centre saw the name Abel on the front pages of American newspapers they would realize he had been captured. During Fisher's detainment the FBI had been searching his hotel room and photo studio, where they discovered espionage equipment including shortwave radios, cipher pads, cameras and film for producing microdots, a hollow shaving brush, and numerous "trick" containers including hollowed-out bolts. In Fisher's New York hotel room the FBI found four thousand dollars, a hollow ebony block containing a 250-page Russian codebook, a hollow pencil containing encrypted messages on microfilm and a key to a safe-deposit box containing another fifteen thousand dollars in cash. Also discovered were photographs of the Cohens and recognition phrases to establish contact between agents who had never met before. Conspiracy to act in the United States as an agent of a foreign government without notification to the Secretary of State – 5 years imprisonment. Häyhänen, Fisher's former assistant, testified against him at the trial. The prosecution failed to find any other alleged members of Fisher's spy network, if there were any. The jury retired for three and a half hours and returned on the afternoon of October 25, 1957, finding Fisher guilty on all three counts. On November 15, 1957, Judge Mortimer W. Byers imposed on Fisher a total sentence of thirty years and fines of three thousand dollars. The United States Supreme Court upheld his conviction by a vote of 5-4. Fisher, or "Rudolf Ivanovich Abel", was to serve his sentence (as prisoner 80016–A) at Atlanta Federal Penitentiary, Georgia. He occupied himself with painting, learning silk-screening, playing chess, and writing logarithmic tables for the sheer enjoyment of it. He became friends with two other convicted Soviet spies. One of these was Morton Sobell, whose wife had failed to receive the five thousand dollars embezzled by Häyhänen. The other prisoner was Kurt Ponger, an Austrian who had been sentenced for conspiracy to commit espionage. Fisher served just over four years of his sentence. On February 10, 1962, he was exchanged for the shot-down American U-2 pilot Francis Gary Powers. The exchange took place on the Glienicke Bridge that linked West Berlin with Potsdam, which became famous during the Cold War as the "Bridge of Spies". At precisely the same time, at Checkpoint Charlie, Frederic Pryor was released by the East German Stasi into the waiting arms of his father. A few days later Fisher, reunited with his wife Elena and daughter Evelyn, flew home. For the sake of its own reputation it suited the KGB to portray "Abel's" nine years of being an undetected agent in the United States as a triumph by a dedicated NKVD member. 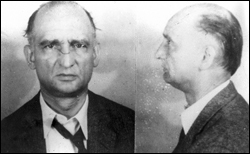 The myth of the master spy Rudolf Abel replaced the reality of Fisher's illegal residency. Yet the party hierarchy was well aware that Fisher had achieved nothing of real significance. During his eight years as an illegal resident he appears not to have recruited, or even identified, a single potential agent. After his return to Moscow, Fisher was employed by the Illegals Directorate of the KGB's First Chief Directorate, giving speeches and lecturing school children on intelligence work, but became increasingly disillusioned. He made a notable appearance in the foreword to the Soviet spy film Dead Season and also worked as a consultant on the film. Fisher, who was a heavy smoker, died of lung cancer on November 15, 1971. His ashes were interred at the Donskoy Cemetery under his real name, and a few Western correspondents were invited there to view for themselves the true identity of the spy who never "broke". In Steven Spielberg's 2015 film Bridge of Spies, Fisher/Abel is portrayed by Mark Rylance. For his performance, Rylance won the Academy Award for Best Supporting Actor and the BAFTA Award for Best Actor in a Supporting Role. ^ Arthey (2004), p. 77. ^ a b c d Arthey (2004), p. xvi. ^ a b Arthey (2004), p. 10. ^ a b c d e f g h i j k l m "FBI: Rudolph Ivanovich Abel (Hollow Nickel Case)". Federal Bureau of Investigations. Retrieved: January 4, 2012. ^ Whittell (2010), p. xi. ^ a b c Whittell (2010), p. 109. ^ a b c Arthey (2004), p. 73. ^ a b c d Whittell (2010), p. 9. ^ a b Arthey (2004), p. 11. ^ Arthey (2004), p. 8. ^ a b c Andrew (1999), p. 146. ^ a b Whittell (2010), p. 10. ^ Arthey (2004), p. 49. ^ Arthey (2004), p. 50. ^ Arthey (2004), pp. 75–76. ^ Damaskin (2001), p. 137. ^ a b Arthey (2004), p. 62. ^ Arthey (2004), p. 63. ^ Hearn (2006), p. 10. ^ Arthey (2004), p. 76. ^ Arthey (2004), p. 81. ^ Arthey (2004), p. 84. ^ Andrew (1999), pp. 146–147. ^ Damaskin (2001), p. 140. ^ Sudoplatov/Schecter (1994–1995), p. 168. ^ Whittell (2010), p. 13. ^ Arthey (2004), p. 163. ^ a b c d e f g h Andrew (1999), p. 147. ^ Whittell (2010), p. 17. ^ a b Whittell (2010), p. 18. ^ Andrew (1999), pp. 147–148. ^ Whittell (2010), p. 16. ^ a b Andrew (1999), p. 148. ^ Whittell (2010), p. 19. ^ Arthey (2004), p. 187. ^ Bernikow (1970), p. 52. ^ Whittell (2010), pp. 20–21. ^ a b c d e Andrew (1999), p. 171. ^ Whittell (2010), pp. 21–22. ^ Bernikow (1970), p. 21. ^ Hearn (2006), p. 13. ^ "New York Times: The Spy of Cadman Plaza". New York Times. Retrieved: February 2, 2013. ^ Whittell (2010), p. 25. ^ a b c d Hearn (2006), p. 15. ^ Arthey (2004), p. 201. ^ a b c d e Andrew (1999), p. 172. ^ a b Whittell (2010), p. 80. ^ Whittell (2010), p. 81. ^ Whittell (2010), p. 88. ^ Andrew (1999), p. 280. ^ Whittell (2010), p. 89. ^ a b Whittell (2010), p. 94. ^ Whittell (2010), p. 92. ^ Whittell (2010), p. 95. ^ West (1990), p. 91. ^ Bernikow (1970), p. 111. ^ Whittell (2010), p. 96. ^ Arthey (2004). p. 205. ^ Romerstein (2001), pp. 209–210. ^ a b Whittell (2010), p. 97. ^ Donovan (1964), pp. 22–26. ^ "Thomas Debevoise, Prosecutor, 65, Dies". New York Times. New York, NY. February 9, 1995. ^ Whittell (2010), p. 107. ^ Bigger (2006), p. 85. ^ Bernikow (1970), p. 253. ^ Bernikow (1970), p. 255. ^ Andrew (1999), p. 174. ^ Whittell (2010), p. 251. ^ a b Whittell (2010), p. 258. ^ a b Andrew (1999), p. 175. ^ Propaganda, KGB style Archived August 11, 2011, at the Wayback Machine Agentura.ru. The Secret Services Watchdog. Retrieved: May 13, 2014. ^ Profession has degraded since the Cold war – former KGB officer[permanent dead link] RT.com. Retrieved: May 13, 2014. ^ Whittell (2010), p. 259. ^ Catherine Gee (February 29, 2016). "Mark Rylance wins Best Supporting Actor in the most high profile British win of Oscars 2016". Telegraph.co.uk. Retrieved May 17, 2016. ^ "BAFTA Film Award Nominations and Winners 2016". BBC One. February 10, 2016. Retrieved May 17, 2016. Andrew, Christopher. (1999). The Sword and the Shield: The Mitrokhin Archive and the Secret History of the KGB. Basic Books. New York. ISBN 0-465-00310-9. Arthey, Vin. (2004). Like Father Like Son: A Dynasty of Spies. St. Ermin's Press in association with Little Brown. London. ISBN 1-903608-07-4. Bernikow, Louise. (1970). Abel. Introduction by Burt Silverman. Hodder and Stoughton. London, Sydney, Auckland, Toronto. ISBN 0-340-12593-4. Bigger, Philip J. (2006). NEGOTIATOR: The Life And Career of James B. Donovan. Bethlehem: Lehigh University Press. United States. ISBN 978-0-934-22385-0. Damaskin, Igor with Elliott, Geoffrey. (2001). Kitty Harris: The Spy With Seventeen Names. St. Ermin's Press. London. ISBN 1-903608-06-6. Hearn, Chester G. (2006). Spies & Espionage: A Directory. Thunder Bay Press. San Diego, California. ISBN 978-1-59223-508-7. Romerstein, Herbert. (2001). The Venona Secrets: Exposing Soviet Espionage and America's Traitors. Regnery Publishing Ltd. Washington, D.C. ISBN 978-0-89526-225-7. Sudoplatov, Pavel; Sudoplatov, Anatoli; Schecter, Jerrold L. and Schecter, Leona. (1994). Special Tasks: The Memoirs of an Unwanted Witness, a Soviet Spymaster. Little Brown. Toronto, Canada. ISBN 0-316-77352-2. Wikimedia Commons has media related to Rudolf Abel. Washington Times: "U.S. intel braces for Kremlin blowback as result of spy case". Retrieved: December 29, 2010. FBI: Rudolph Ivanovich Abel (Hollow Nickel Case) Retrieved: August 8, 2016. New York Times: The Spy of Cadman Plaza. Retrieved: February 2, 2013. New York Times: ABEL, SPY SUSPECT, ACCEPTS DONOVAN; Russian Has Long Talk With Former O.S.S. Counsel Who Will Defend Him Returned to Detention Cell(subscription required) Retrieved: March 20, 2013. Bridge of Spies Movie Trailer Retrieved: October 9, 2015. Rudolf Abels' Grave Retrieved: October 9, 2015.